Rage! Boiling hot rage! The phantasm within this trap has grown so angry at all of the mice that have slipped from its grasp, that it has quite literally boiled over, causing its chrome to melt. A furious, fiery version of its former self, it vows to allow no further such trespasses! The Molten Oasis Skin can be used on the Chrome Phantasmic Oasis Trap. The trap's stats (power, power bonus, attraction bonus, etc.) are not changed. The Molten Oasis Skin may be made available during the annual Halloween event and can be traded on the Marketplace or through Give To Friends. 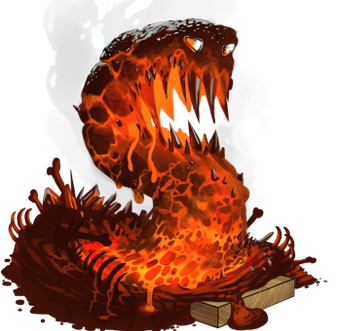 14 October 2014: The Molten Oasis Skin was introduced as part of the Halloween 2014 event. This page was last edited on 9 December 2017, at 14:08.